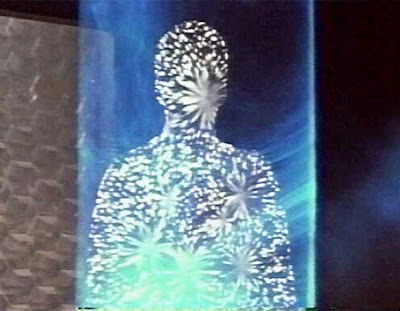 Home » quantum physics , science , star trek , teleportation » Scientists teleport matter across a meter distance! Scientists teleport matter across a meter distance! Teleportation of matter has been achieved over a distance of one meter, scientists at the Joint Quantum Institute of the University of Maryland along with colleagues at the University of Michigan have announced. 'Course, the matter in question was a single atom, but to transmit the information of its quantum state from one location to another - via that spooky "entangling" thingy - is still a huge milestone to have achieved. And if you read the Fox News story, it does sound suspiciously like the "beaming" used in the Star Trek franchise, right down to the "Heisenberg Compensators". ...they actually used a still of the "transporter malfunction" scene from Star Trek: The Motion Picture - the most violent teleportation accident ever depicted on screen - to go with the article. Actually, Chris, that shot is from when Admiral Kirk beams over to the orbital station to tour the exterior of the Enterprise with Scotty. Sorry, but I'm a huge Trekkie, and I've watched TMP tons of times when I was little. And I can tell that that is William Shatner.